STATEN ISLAND, NY (September 5, 2012) - The Hon. 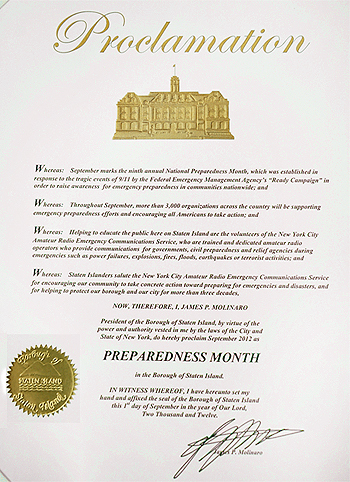 James P. Molinaro, Staten Island Borough President issued a Proclamation today, declaring September as 'Preparedness Month' on Staten Island, New York. This was announced in partnership with the New York City Amateur Radio Emergency Communications Service (NYC-ARECS), an organization made up of New York City-based licensees of the Federal Communications Commission (FCC) who volunteer their time and specialize in emergency communications in Staten Island and all five boroughs. Staten Island is home to 470,000 New York City residents. "These activities, along with a vigilant public, contribute to an overall level of preparedness that is critical to the safety of Staten Island, our city, and our entire country," said Shelomo Alfassa, NYC-ARECS Public Information Officer. Both Borough President James Molinaro and NYC-ARECS, encourages all New Yorkers to become more involved with preparing for emergencies in their communities. 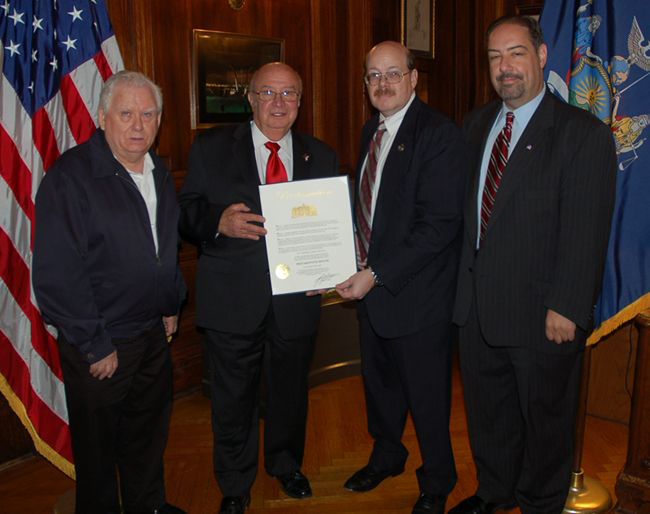 Long-time resident of Staten Island, NYC-ARECS President, Charles Hargrove, said: "We thank Borough President Molinaro for his dedicated support of Preparedness Month. We should remember, only by working together as a team, can a community truly be ready for emergencies and disasters. Volunteers can support disaster efforts in their communities. People can get trained and volunteer with a Community Emergency Response Team, Medical Reserve Corps unit and/or other Citizen Corps Partner Program." "There are many local faith-based and community organizations that have programs active in supporting disasters too," he added. Information on ways to participate in Preparedness Month activities on both Staten Island and across New York City, can be found at FEMA's Ready Campaign website: ready.gov and on the website of the New York City Office of Emergency Management at nyc.gov/html/oem. Persons interested in learning more about NYC-ARECS should visit: nyc-arecs.org.